Leave a Comment on What’s In a Name? Our exhibition, Our Boys, Cockshutt Remembers the Fallen of the Great War, set out to tell the real-life stories, before conscription, of the men behind the names on the War Memorial. It was a theme which evidently intrigued a great many people from both near and far, as evidenced by the contributions they made to the displays. As each artefact (each with its own story to tell) was brought forward and added to the exhibition, it helped with the building of the powerful story of how ordinary young men, quietly getting on with their lives in a quiet, rural back-water, became embroiled in one of the most terrible, barbaric conflicts ever known. Honourable and duty-bound, their hopes and aspirations were cruelly and swiftly snatched away as they each died a brutal, agonizing death, far from home. It is testament to the willingness of Our Boys, to go that extra step in the pursuit of freedom, truth and justice, only too aware that death lurked all around them, that inspired so many of us to be a part of the telling of their stories. 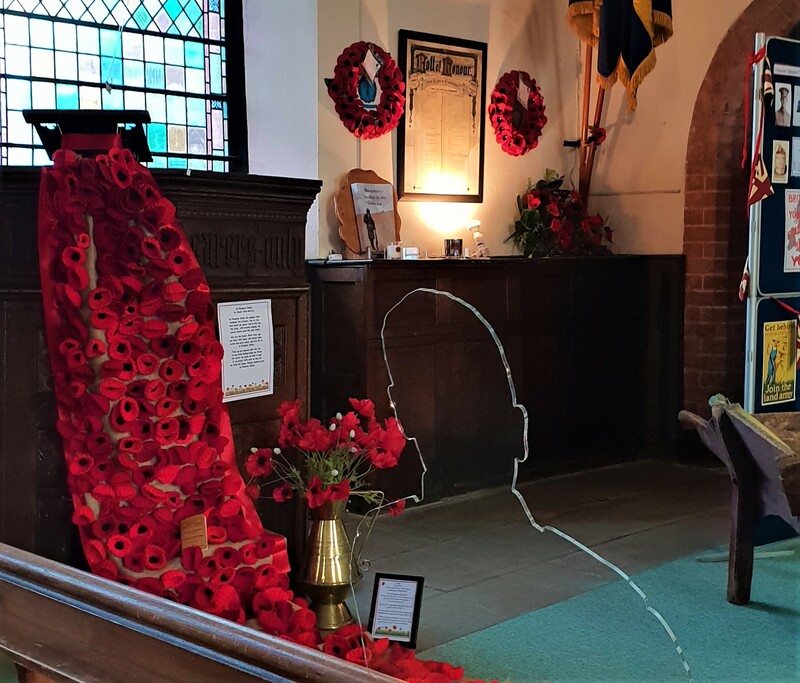 As time moves on and we have chance to catch our breath and reflect upon how we paid homage to our WW1 fallen, the word that comes to mind is, quite simply, “inspirational.” So many people wanted to be involved, from the very young to the not quite so young! We knitted, carved and baked; unearthed family heirlooms and borrowed bridles from our horses. Others lent military uniforms, academic caps and gowns and even an aeroplane propeller. The flower arrangements were amazing, as was the enormous hand-crafted poppy banner hanging from the tower. The music provided a calm and reflective ambiance. The list is endless, but above all and in whatever capacity, everyone gave their time and support in loving remembrance of Our Boys. Such a postcard would have been sent home by KSLI soldiers serving in the trenches. Sent home by troops during WW1. Originals were sent home during WW1. Copy of the Shropshire Roll of Honour (original kept in St. Chad's Church Shrewsbury). Kindly donated by a resident. The same today as one hundred years ago. These were used for study, reference and engineering tasks, one hundred plus years ago. "To the men who fell". Made by a Grandmother and her Grandson. These would have been used in kitchens, in vegetable gardens, one hundred years ago. Thought to have been used between the Wars. Before electricity, candles were used to provide light. Designed and made by a resident to commemorate the signing of the Armistice. Many villagers made poppies, including Lilac ones in remembrance of the animals who died in service. 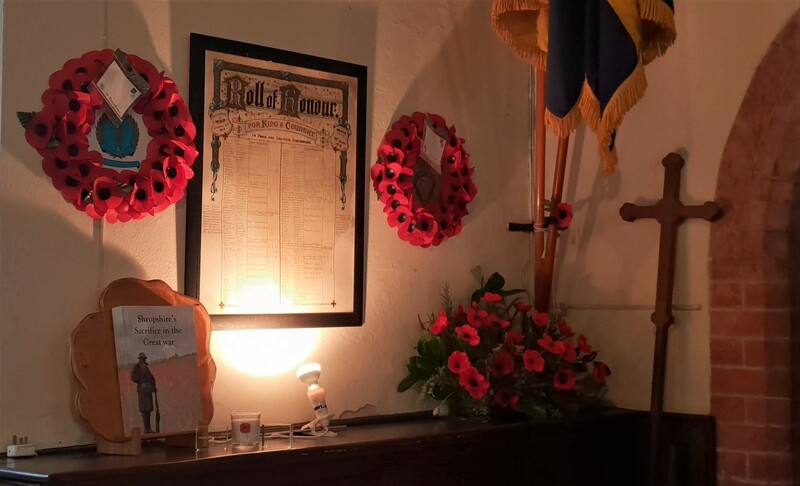 Image of the War Memorial and exquisite, hand-made tumbling Poppies. Commemorating both the fallen and those who returned from the Great War. Made for copy of "Shropshire's Sacrifice in the Great War". Dedicated to the "Bringing Home of Our Boys". Made by children from the village school. Made by Messy Church and placed in the churchyard. Spending an afternoon with Y5 & 6 children in the local school, talking about the men behind the names on the War Memorial. 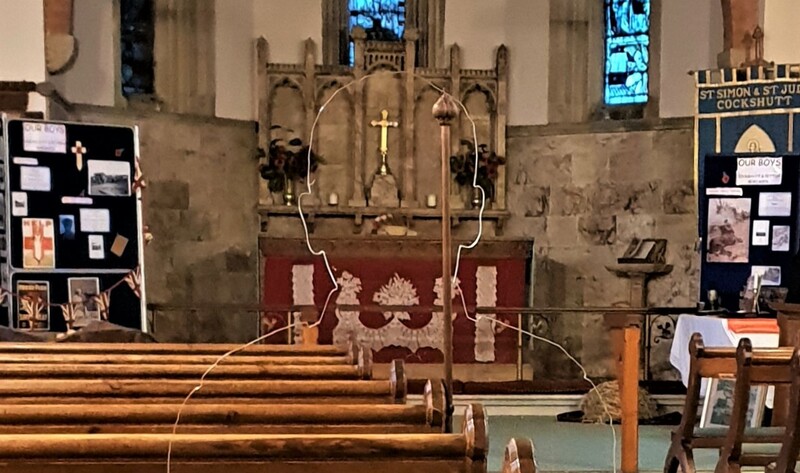 At 11am, on 11th November 2018, the packed Parish Church of Ss Simon & Jude, Cockshutt joined the nation, as we fell silent in hushed tribute to all those who have died whilst serving our country, keeping us safe from harm. Peacefully sitting amongst were the silhouettes. Ethereal, There, But Not There, they provided a channel for our thoughts and prayers as we tried to comprehend the debt we owe to all those who have fallen in the name of justice, peace and freedom. As the names of our WW1 fallen were called out and our attention focused on the hundred years centenary of the 1918 Armistice, it really did feel as if we had finally brought Our Boys home.